Shorten practice by 5 minutes every other week. By the end of the year, practice will be 30 minutes shorter. It makes it easy only finding 5 minutes to take out instead of finding 25 minutes in week 8. Haven't read all the responses here, but this is what should be expected when we get kids rolling in January and they can't enjoy being teenagers. I'd love to hear about somebody who maybe makes the playoffs and then just goes into Gagliardi mode with the team and comes out in shorts and t-shirts just running through team for an hour the rest of the year, I bet you could gain a serious advantage doing that, I'm not a sports scientist but after 11-12 weeks of this stuff I figure the guy who can tackle can tackle and the guys who can't probably aren't about to learn all of the sudden. Let's get the game plan in, rep the plays against the looks and gtfo. Problem with that is, as soon as you lose your playoff game the rail riders and daddy ball coaches in the stands will be showing their behind all over the community talking about how "the boys got beat 'cuz they jus' ain't got no toughness! and coach ain't even got 'em hittin' in practice, ooh boy in my day we did bullntharang every dang wednesday and whooooweee we wuz tuff!" Check out Brad Dixon on Twitter. He coaches at a small farming school outside of Quincy, IL and his practices (he posts them) are very different. From what I remember, he takes Monday’s off and treats Tuesday’s like what most do for Monday (film review, walk through). There's no exact answer for a question like this but I have been associated with teams that have lost focus, even when competing deep in the playoffs. - We only workout three days a week in the summer. - We've stopped doing any weekend 7 on 7's. - We do not workout after school in the off-season. - We do not practice on Monday's during the season. Film only. - We do not meet at all on the weekends, including coaches. - We interview/discuss things with our players year-round to "feel" the pulse. After reflecting on this past season, we certainly could work on varying practice up more. This was one of the biggest complaints from previous players after interviewing them upon starting at a new school. 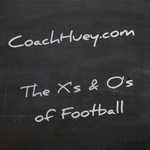 ThadWells.com - My coaching blog. What I found to be effective if your squad made the playoffs...was NOT to ramp it up...but actually go back to "spring like" practices. What I mean by that was keeping it simple. Focusing on details and technique again. It kept players fresh and was refreshing to go back to basics. There were moments of high impact, but the practices seemed really crisp and focused.